The one thing which a perfect weekend should offer Bengalureans is respite from crowded roads and long parking lines – but if our idea of fun is the nearest brewery, what do we expect? As Anjali skimmed through the Events feed on Facebook, she couldn’t help wondering when her life had become so predictable. Just two years ago, she had moved from Delhi for a higher-paying job at the pub capital of India, but what had really convinced her to move away from her friends and parents back home is the refreshing culture that Bengaluru promised, the opportunity to try something new. But here she was, looking at the same uninspiring list of events and parties. Some of the DJs had become regular fixtures of her weekend nightlife, she had some of their playlists memorized. Many pubs had even stopped live music after the government crackdown last year. The theatre scene was great, but sometimes you just don’t feel like drama. Saturday mornings are a chore for her, trying to arrive at a consensus on ‘what do we do tonight?’. If you have spent the past few years of your life in Bengaluru, you are Anjali. You could even be a more frustrated version of her, if you own a car. The one thing which a perfect weekend should offer you is respite from crowded roads and long parking lines. But if our idea of fun is the nearest brewery, what do we expect? Don’t get us wrong, the soul needs good music, fresh draught beer and great food. But the Bengaluru weekend culture needs a serious reboot. And here’s how – widen your horizons beyond the pubs and discotheques of Indiranagar or Koramangala. Drive past the microbreweries of Whitefield. Explore new places and find adventure in some of the most fun spots, outside Bengaluru. Bonus: you don’t have to go too far. You would think kayaking is that distant dream, an adventure during that Rishikesh trip which has been in the making forever. But what if we told you that you could have a thrilling ride on a river just a few hundred kilometres from the city and you can be back before the weekend ends? Or how about a stimulating night trek at a mountain fortress just outside of Bengaluru, and all you need is a day? 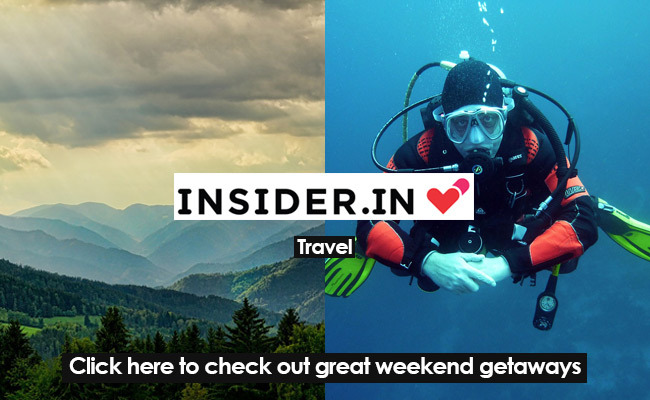 And here is an offer you cannot refuse – an exhilarating scuba dive just off the coast of Karnataka, from an island on the Arabian Sea, within the weekend. These are just two of the long list of travel spots Insider.in has put together for your travel plans during the weekend (and longer, if you have the time. What are those Casual Leaves for?) There are jungle camping tours at Agumbe, heritage hikes at Hampi and a lot more for you and your friends, or that special someone. Go to Insider’s Travel page and check them all out. This article was produced in association with Insider.in by TNM Marquee.